Theoretical work and research on large invertebrate axons has suggested since at least the 1970s that axon geometry contributes to signal processing in the nervous system. The fact that the distal ends of axons are of much smaller diameter than near the neuron cell body suggests that action potentials become wider and decrease in amplitude as they move towards an axon’s synaptic bouton. This is a direct consequence of cable theory. As a cable’s diameter decreases its surface to volume ratio increases. Figure 1. The branch point of this simulated mylenated axon filters some action potentials. 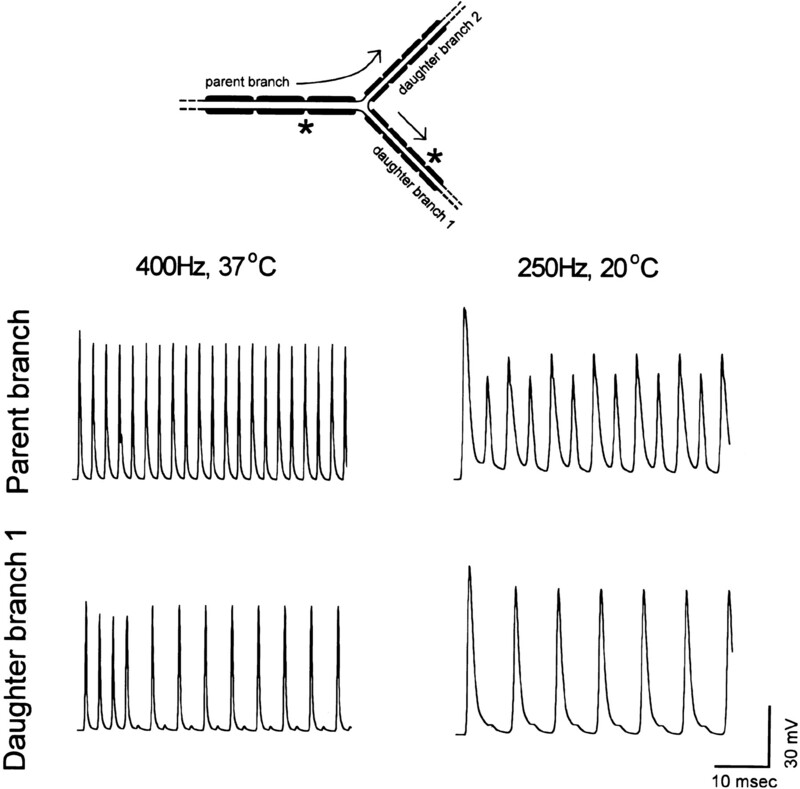 Intermittent conduction failures are apparent by comparing the responses of the parent branch to those of the daughter branches. Figure 4 from “Computer Model for Action Potential Propagation Through Branch Point in Myelinated Nerves” by Stefanie Hampel, Phuong Chung, Claire E McKellar, Donald Hall, Loren L Looger and Julie H Simpson. Journal of Neurophysiology, January 2001. At axon branch points the cross sectional area of the two daughter branches together generally present more area than the cross sectional area of the parent axon resulting in the presentation of greater electrical resistance by the daughter branches. This slows down or even stops action potentials and increases their amplitude at the branch point. This can result in filtering of action potentials or even their saltatory conduction along the axon’s branch points depending on the particular biophysical properties of the axon involved. The authors of a new paper “Action-Potential Modulation During Axonal Conduction” (published February 4, 2011 in Science) hypothesized that signal processing in the axon may involve more than process geometry. They hypothesized that action potentials are subject to waveform modulation while they travel down axons due to local alterations in the ion conductance from the interaction of neurotransmitters or even gliotransmitters. The research team recorded action potentials from axon branches of hippocampal CA3 pyramidal neurons from slice cultures. They found that waveforms of axonal action potentials increased in width in response to the local application of glutamate and an adenosine A1 receptor antagonist to the axon shafts, but not to other unrelated axon branches. Glutamate appeared to modulate action potentials by depolarizing axons through AMPA receptor activation. Next, they showed that activated astrocytes broadened action potentials in adjacent axons. The broadened action potentials resulted in larger excitatory postsynaptic currents on the target neurons. This entry was posted in Brain Science and tagged Brain Science on February 8, 2011 by Donald Doherty.